Dave Rudden visited early in the new year and gave a workshop to 6th Years just before the mock exams began. The focus of the workshop was on helping the students get to grips with the creative element of the Leaving Cert. English Paper 1. He gave them samples of personal essays and went through how to construct a good quality essay. He broke down the marking scheme of the paper and explained that the examiners were looking for in each element. 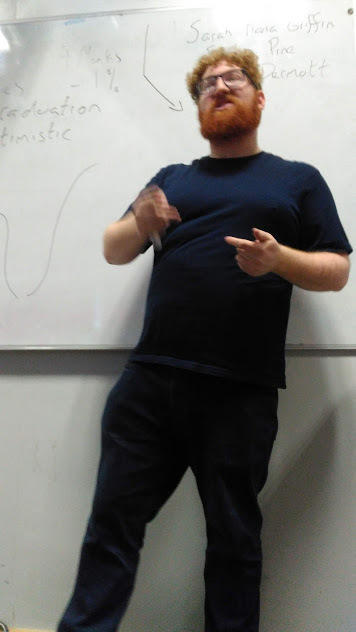 He also talked about short stories and gave them a crash course in character development and plot twists. The content of the talk was extremely useful and the delivery was fun. Students praised the tips he gave them and felt that he should give the workshop to 6th Years every year. With this in mind, we are hoping he will return again for next year’s Leaving Cert. class. A group of 6th Year History students travelled to Tallaght Library to hear Author Declan Power talk about the experience of Irish Defence Forces personnel during the siege of Jadotville in 1961. The events have recently been made into a film and Declan Power has also written a book on the subject. Alysia Cloake from 6th Year has written her Leaving Cert History Project on the siege and she was complimented on her knowledge of the subject by Declan Power. 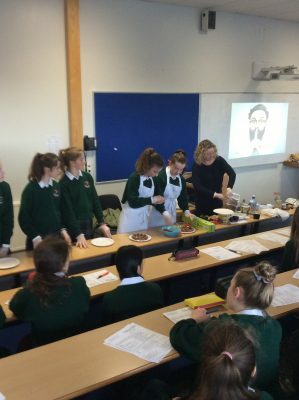 Lynn Dalton from Grenville Nutrition came into Beaufort today to give a talk on the seven eating habits of healthier families to all 1st Year Home Economics students. The workshop was fun and interactive. The girls had the opportunity to evaluate their diet and learned to draw up their own meal plan for a day. The best part of the workshop was the practical session – making those gorgeous chocolate protein power balls! A big thank you to Lynn for all her good advice today and to Ms. Campbell the School Librarian for arranging the visit. 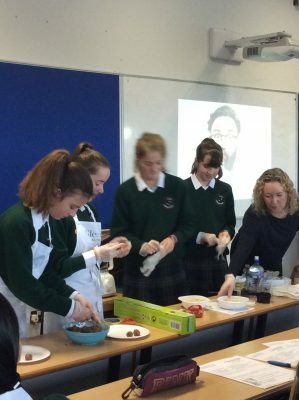 1st Years had a fantastic morning in Ballyroan Library making bath salts, lip balm & bath bombs on a workshop hosted by Anyone4science. Huge thanks to Gary LaCumber, Viktoria and all in Ballyroan Library. This year the Library was decorated for Halloween with the artwork of some very talented 1st Year students from Ms. Bowe’s and Ms. Kearney’s classes. 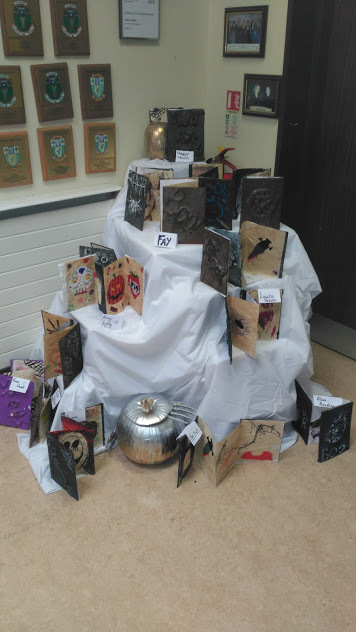 Their beautiful Halloween-themed book covers were displayed inside and outside the Library. 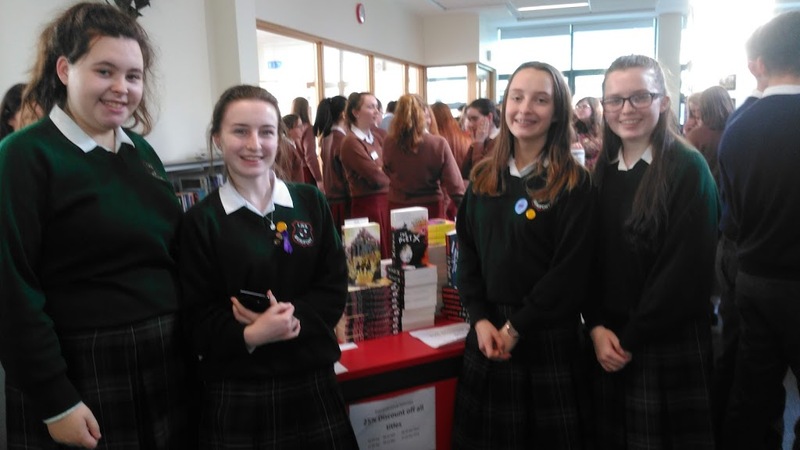 This year the Library has a 4 person TY Committee and one Senior Student Librarian, Alison Kelly. The TY group consists of Caoimhe Brennan, Aislinn Cosgrave, Grainne Cawley and Eve Conlon. 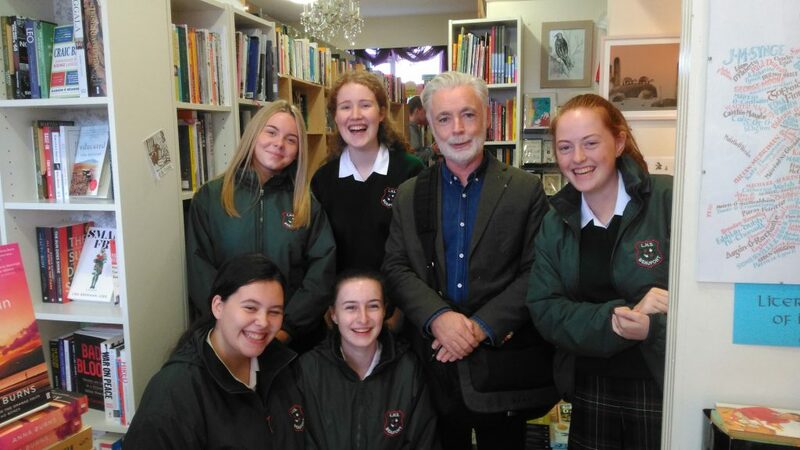 Their first official trip of the new school year was to Raven Books in Blackrock to buy books for the library. The trip began with a hot chocolate (or coffee for some) and then they got to meet the wonderful Louisa Cameron and her famous customer Eoin Colfer! Lots of new books were chosen to fill the shelves for the new school year. Book Clubs meet for each year group once a month at lunchtime in the library. Members discuss their current reading choices, share news of old favourites and recommendations for future reading. Check the Library Notice Board for the current book club dates. New members are welcome to join at any time. Book Club news features in our newsletters.